When birds land, roost and nest on your property they create a hazardous, unsightly and costly mess. Here are three reasons why bird control is a great investment and a few products that can be used to solve your bird control problem. Bird droppings carry any of 60 transmittable diseases that are easy for humans to contract. Nesting materials are just as infectious as bird droppings as they have bugs, mites and remnants of bird droppings. Eliminate costly clean up created by pest birds’ messy lifestyle. Depending on how long birds have been nesting in an area, there could be thousands of dollars in damage and clean up. Bird droppings contain acidic substances that can stain or corrode certain building materials if left unattended. Bird droppings are messy and slippery. If bird droppings are on walkways or entryways, there is the risk of someone slipping and falling, which could result in injury and a lawsuit if it’s on at a business or on public property. 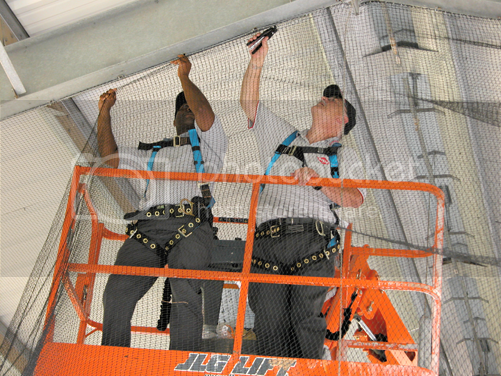 Bird Netting is a full exclusion bird control product. Heavy duty bird netting creates a physical barrier to prevent birds from landing or nesting. It is the most efficient and effective method for excluding birds to ensure they cannot access an area to build or rebuild their nests. This product is effective for all bird species. Use a U.V. stabilized polyethylene mesh bird net that is sun and weather resistant and rot proof. Depending on the pest bird, there are different mesh sizes available: ¾” 1 1/8” and 2”. Bird Jolt Flat Track is a low profile, electrical track system that produces a mild electrical shock when birds land on its surface. The shock will not harm birds, but will condition them to stay away from the area, making Bird Jolt Flat Track the ultimate in bird behavior modification. Bird Jolt Flat Track is the only electric track bird deterrent system with patented anti-arcing and glue trough designs and is the safest most effective electric track available. It is also available in six colors: clear, black, grey, stone, terra cotta, and red. The choice to invest in bird control can save you time, money and potentially hazardous situations. When it comes to bird control, anyone can determine whether or not a bird problem exists, but that doesn’t get you too far unless you are a certified bird control expert. Without understanding and being able to identify the details of bird problems, it could be anyone’s guess as to what the real issues is and what it will take to resolve the problem. Being properly trained is a key component to becoming a certified bird control expert. Being trained as a bird control expert equips you with the tools to assess a situation, analyze the bird species and behavior, ask the right questions, recommend a solution(s) and implement the solution. If you are evaluating a bird control problem with no expertise, you might find that while you can identify certain aspects of the problem, the whole picture isn’t always revealed unless you have been trained to look for certain details and to ask specific questions. One of the most common errors to stem from lack of training is recommending the wrong product or solution. Being properly trained allows you to identify and analyze every aspect of the situation, starting with asking the right questions. 1. What type of bird? Identifying the species of bird is paramount in determining a solution. Different bird species have different behavior patterns so it’s important to understand the type bird you are dealing with. Additionally, not all bird control products are effective in deterring all bird species. 2. Where are they? Knowing where the birds are located on the premises is another key component to providing a solution. 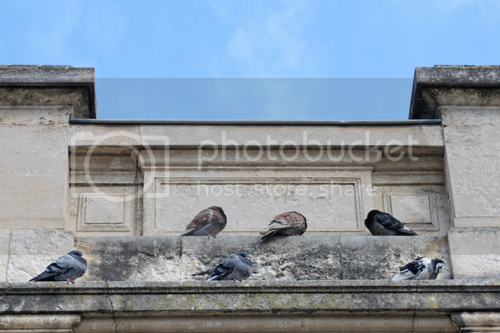 Birds on a roof are a different problem from birds gathering around an entryway. Certain products that are recommended for roofs and ledges would not be applicable to the walkway outside a building or office. 3. What are they doing? Bird behavior on the premises is just as important as knowing where they are located. 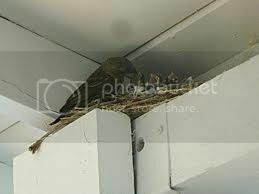 If a bird is nesting, a completely different course of action may be taken than if the birds are landing or roosting. 4. How many? The last major question to ask customers is how many birds there are. A few birds could be cause for a single product whereas dozens of birds might require multiple products. Often times the customer will not know all the answers so doing a site evaluation is best when possible. Depending on the Q/A session or site evaluation, a single product may be suggested or an integrated solution may be implemented. Products that work for larger birds are bird spikes, bird netting, bird wire and electric flat track. Recommending a product or solution isn’t dependent only on the size of the bird; it is also based on behavior of the bird. If birds are nesting, full exclusivity is required to keep the birds entirely away from the nesting area. In this case bird netting or bird slope would be recommended to prevent birds from accessing the area. When birds are landing and roosting, however, other bird deterrents can be used: bird spikes, bird gel, bird jolt flat track and bird wire. Unhappy tenants create unhappy property managers. As a property manager it is your responsibility to upkeep the property so the tenants are happy and for the longevity of the property. When birds are sitting, pooping and nesting on roofs, canopies, window seals, balconies, in trees and other areas, it creates a mess that visually unappealing and damaging in some cases. It also poses health risks for your tenants and employees and legal risks for property owners. Bird Control is necessary for property managers. Depending on the type bird you are dealing with and where they are located on the property, there are several solution possibilities to keep birds away. Bird Jolt Flat Track™, Bird Spikes and Bird Slope™ are a few options for property managers when it comes to getting rid of birds and maintaining your property. Bird Jolt Flat Track is a low profile electrical track system that gives off a slight shock when birds land on the surface of the strip. The shock will not harm the birds; it will condition them to stay away from the treated area. Flat Track is now available in several colors: clear, black, gray, stone, Terra Cotta and red. Bird spikes are a physical bird deterrent used to prevent larger birds, like seagulls and pigeons, from landing and nesting. The spikes will not harm the birds or humans. The spikes simply create an uneven surface making it impossible for the birds to land in a particular area. Bird Spikes come in a stainless steel or plastic. Depending on the width of the ledge, roofline or problem area, you can choose 3”, 5” or 8” stainless steel spikes and 3”, 5” or 7” plastic spikes. Bird Slope keeps birds of all types and sizes from perching and roosting on ledges, beams, eaves and other 90° angle areas. Slope extenders are available for ledges up to 10” wide and end caps ensure birds don’t find their way behind the slope. Keep your tenants safe and happy and your property clean! Use bird control products to keep pest birds away from your property! 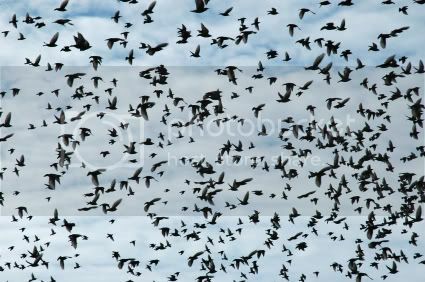 Birds that gather in large flocks are more difficult to manage than a few pest birds landing and nesting on your property. There are many methods to deter birds but when you have a large group the situation can become overwhelming. At this point you should consider flock reduction. The best way to reduce a flock is by utilizing professional trap and release methods. While bird spike, electrical track systems or netting, will deter birds and keep them from nesting and roosting in treated areas, but then you will most likely be dealing with a large group of displaced homing birds. The Super Talon Ultra Net Launcher is a humane method of trapping the birds in order to release them in a more appropriate environment. 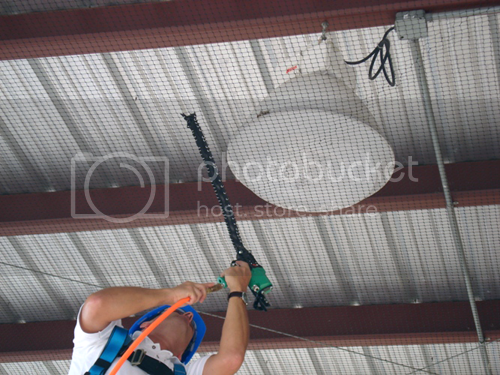 The net launcher uses compressed air cartridges to launch a weighted net up to 60 feet. The two inch mesh used with the net launcher can be used to trap any size bird. It comes complete with a carrying case and all necessary components and it can be re-used over and over. Consider using trapping methods to get rid of birds on your property. There are professional services that will perform the actual trap and release of birds for you. Give us a call and we will help you choose the right trapping device and connect you with a professional trapper in your area. Keep birds away from your property! With their open courtyards, outdoor eating tables and overflowing garbage cans, schools can draw pigeons by the hundreds, especially during bird season. 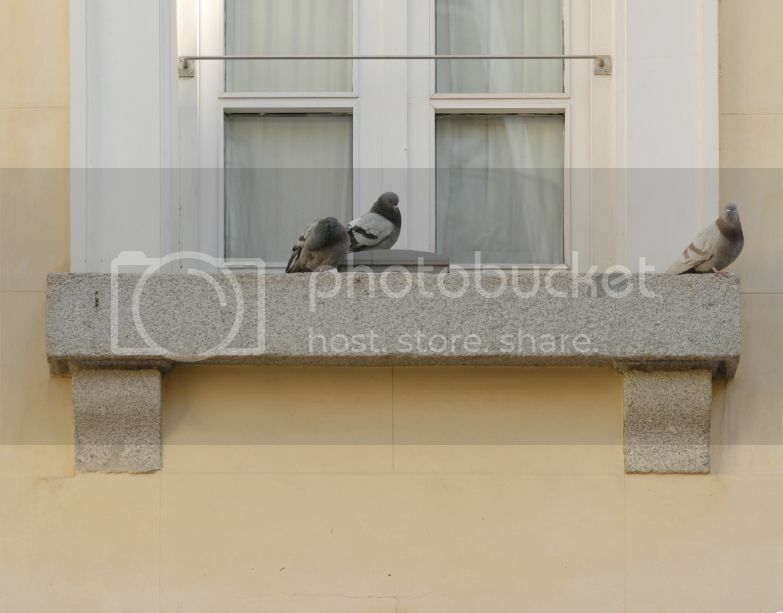 Without effective pigeon control measures to deter them, pigeons can deface school property and leave mounds of disease-carrying droppings. These droppings—which can carry salmonella and e-coli—will cover benches, tables, playground equipment, even doorknobs. Wet pigeon droppings are very slippery and leave dangerous slip-and-fall hazards. 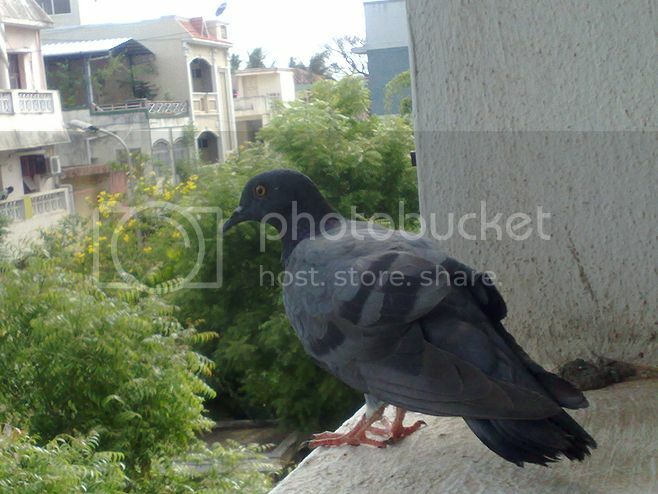 Pigeons love to perch on rooflines, parapet walls and most any elevated area around a school. Bird Spikes deny them the opportunity by making it impossible for them to land. 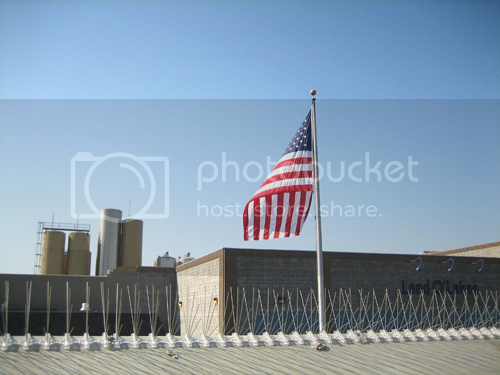 The bird spikes most often preferred by government entities are made of stainless steel with the spikes embedded in a UV-protected polycarbonate base. These have a 10-year guarantee and come in 1”, 3”, 5” and 8” widths to cover wider and wider areas. The spikes have a 1.5” base, which allows them to be glued, screwed, or tied down to narrow landings. The best, high quality bird spikes have been approved by several humane groups around the world–including the US Humane Society and PICAS (Pigeon Control Advisory Service). Ideal for use on rooftops and other flat, elevated areas where pigeons tend to flock, the Repeller 360° is entirely wind powered. The device’s large arms rotate continuously to discourage pigeons from landing. The arms cover a 6-foot diameter area. The end of each arm is covered with a large reflective “predator eye” to intimidate the most determined pigeon. For lasting durability, the stainless steel arms are attached to a UV-protected polycarbonate base. The Repeller 360° assembles easily and can be attached with a variety of available bases. Birds like a nice steady landing perch. Pigeons are no exception. Which is why Bird Wire Systems are so effective in denying them a place to perch. These post-and-spring-wire set-ups are easily installed along any roofline, elevated railing or parapet wall. Post Wire Systems are often used by Federal and State government buildings. As with all bird control devices, it pays to go for quality. The best bird wire systems feature nylon coated stainless steel wire for lasting durability, rain or shine. Pigeons don’t like walking on a sticky surface. One or two steps on Bird Gel and off they go. Bird Gels are easy to applied using the standard caulking guns your maintenance people already have. The chemical stays sticky for six months. If you’re a Facilities or Maintenance Manager, you need to keep your industrial facility clean and your repair and maintenance costs to a minimum. If you have pest bird problems, they can pose a challenge—unless you implement some effective bird control measures. Pest birds can become a costly nuisance, both inside and outside various types of industrial structures. From slippery loading docks to jammed up skylights on manufacturing roofs, pest birds can cause you all sorts of grief. As a Facilities Manager, the buck stops with you when it comes to getting rid of pest birds. Adopting an effective bird deterrent strategy can save your maintenance crews from doing constant cleanups and repairs on expensive AC units, rooftop ventillators and other equipment in and around your facility. About: Dr. Rob Fergus is an ornithologist who specializes in urban ecology and human/wildlife interactions. Dr. Fergus received his Ph.D. in urban bird conservation from the University of Texas at Austin. After founding the Hornsby Bend Bird Observatory in Austin, Texas he created additional bird conservation programs in Austin as the first executive director of the Travis Audubon Society. From 2004 to 2009 he was the Senior Scientist for Urban Bird Conservation at the National Audubon Society. Dr. Rob has teamed up with Bird-B-Gone to help answer pest bird questions closing the gap between the science of nature, and the nature of bird control. Lets face it, most of us like to have birds around, but we have a problem with their droppings. The major complaint about bird droppings involve unsightly or smelly messes, concerns about property damage, as well as potential health risks. Most of the time this is the real problem with bird droppings—we just don’t want to see them. While that is certainly understandable, birds are part of our natural environment so we shouldn’t be too upset about the occasional bird dropping on our car, house, or patio furniture. Bird droppings become more of a problem when we create structures like window sills, decks, or utility lines where birds come to sit frequently and do their duty. If bird droppings are accumulating the first thing to look at is how to alter the landscape so that the birds can’t physically come and sit where they are making the mess. This may be done with architectural or structural modifications to a building or other structure, or by installing bird spikes or some other physical deterrents to keep the birds from being able to land where they want to sit. More rarely accumulations of bird droppings may cause actual structural damage to buildings, bridges, machinery, and automobiles. Bird droppings are acidic, which may cause some damage, but for automobiles the greater damage is done when car finishes expand in the sun and then contract around the dried bird dropping. 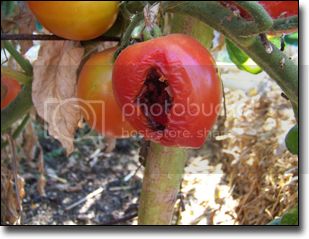 When birds eat berries, their droppings may stain paint, wood, or stucco. To avoid property damage, wash bird droppings from any surface you want to protect as soon as possible. Use a hose with a spray nozzle or a wet rag. If the dropping has hardened, soak it with a wet rag or paper towel for ten minutes to soften it before rinsing or wiping it off. You may want to use a household cleaner or a detergent formulated specifically for killing disease organisms associated with bird mess cleanups such as the Microcide SQ Disinfectant. Histoplasmosis is a disease caused by a contact with or inhalation of a fungus (Histoplasma capsulatum) which grows on bird and bat droppings. Many people are infected without developing symptoms, but the very young and old, and those with compromised immune systems are at increased risk of developing severe infections. Avoid areas with accumulations of bird droppings and if you have to clean up such a site, follow the directions in Histoplasmosis-Protecting Workers at Risk. For more information see the Centers for Disease Control and Prevention website. Cryptococcosis is another fungal disease contracted mostly by breathing in the fungal cells of Cryptococcus neoformans growing on bird droppings. Sometimes the disease causes pneumonia-like symptoms, while other times it spreads to the nervous system causing cryptococcal meningitis. For more information see the Centers for Disease Control and Prevention website. If you have concerns about possible exposure to these diseases, please contact your doctor or a health care professional. For more specific information about bird control products to keep birds from landing and making a mess on your building or other structure, check out physical deterrents that might work in your situation, submit a specific question to nobirds@birdbgone.com, or call a Bird-B-Gone bird control specialist toll free at 800-392-6915.